REHOBOTH, MASSACHUSETTS – 09/06/17 — IronZog launched a Kickstarter campaign on Tuesday to fund the completion of their open world strategy MMO War of Conquest. The campaign is off to a strong start, having raised 34% of its $7000 goal during its first 24 hours. War of Conquest puts the player in control of one nation in a vast fantasy world occupied by thousands of other players’ nations. The goal is to build up the nation’s technological abilities and its prowess with the arcane arts, as well as the player’s skills, in order to compete to capture the mysterious Orbs of Power scattered throughout the landscape. The journey will entail battling over land and resources, developing advances, forging alliances, and constructing and upgrading a wide variety of defensive structures. War of Conquest is based on the 2002 game of the same name, also developed by IronZog. The original game was among the first massively multiplayer strategy games, and pioneered the now dominant freemium payment model. It ran from 2002 through 2011, had over 200,000 players and, despite its rudimentary graphics, developed a cult following that continues to be a presence on social media years after the game went offline. 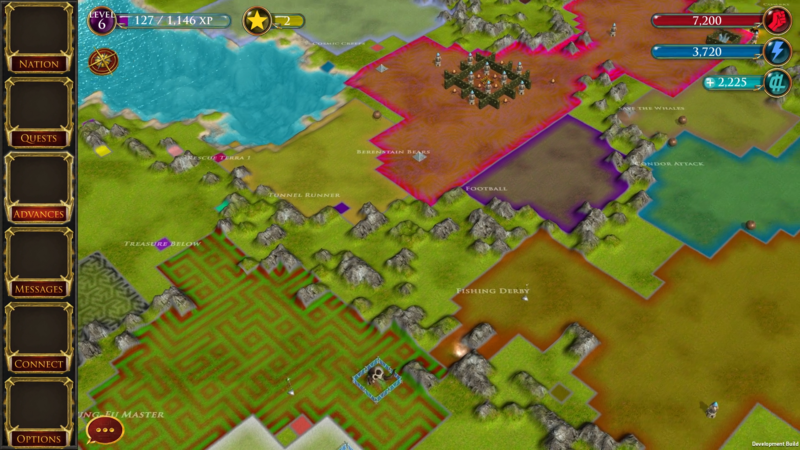 Ferrier names Sid Meier’s Civilization series and the board game Risk as two major influences on War of Conquest’s design. IronZog was founded in 2001 by Michael Ferrier and artist Zach Shukan. Both had recently left Turbine Games where they worked on one of the first massively multiplayer RPGs, Asheron’s Call.